Lap, kidney, rectangle: The pool dilemma | Sydney House. When I grew up in Sydney’s west, the dreamiest dream in the world was to have a pool. A few people we knew had one, but not many. Worst of all, it was deliriously hot the further you got away from the ocean and Sydney’s harbour breezes. A summery 27 degrees celsius in the CBD could translate into a stinkingly dry 35 degrees the further west you went. Prior to this, my parents rented a house which had an above ground. I seem to recall the endless wait for it to fill, and the subsequent demise of the vinyl lined pool generally. A short-lived summer joy. By the 1980s we would sit inside our also-1980s project-build home, sweating and yearning for the green grass out the back that would magically turn to water and save us from certain weather-hell. And we were pretty lucky – our property still had tall trees (!) shading the house whereas many other project homes of the area were on de-nuded or ex-farming plots. My husband’s suburban childhood home was an old 1901 cottage, and about as far from having a pool as anyone could think back in the day. And my father, for good reason, is and was a practical man. A migrant with 30 bucks in his pocket who started a new life for in Australia for our benefit. The prospect of semi-dependable pool filtering technology and endless cleaning would have been too much to worry about for my two working parents. My other dream was that my vast and open primary school playground would slide open (James Bond style) and reveal a delicious, refreshing swimming pool beneath the hot asphalt which we would stare at on 40 degree days, in a woollen uniform, just dying to go swimming or go home. Brutal. It was so hot on those days in the 1970s that one could see the heatwaves rising from the ground. So, we’ve finally arrived in our own place with a big enough yard to contemplate the choices. And the question is whether to have a pool. I feel fortunate but it’s also something subject to a budget! So, we can’t go crazy anyway. And I get it when people decide not to have a pool. Dollar for dollar, you get your money back as far as investment goes, but it rarely pushes the value of a property up by more than that. It is a considerable investment, can run over budget without proper research, and might involve hitting sandstone in Sydney when digging the hole. And then there is maintenance – which isn’t for everyone. When I asked Architect Sam Marshall, “Did you grow up with a pool?” He said: “No, and I absolutely hated it…it would get so hot!”. Alas, he could relate! Apart from my childhood reminiscing, I also wanted to include a pool in our relatively modest plans because we have one teenager, and another only a few years away. They regularly spend time at other people’s places instead of our place being a hub. I’d like our home to be their hub. A place for friends and our family too. Plus, we like being in water, I swim daily at the local pool if I can and don’t mind the idea of being one of those 80 year old grannies that swim at North Sydney Pool without fail. 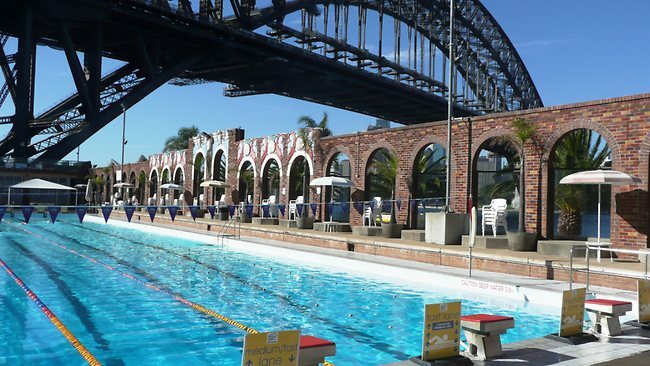 And it’s true: Sydney has absolutely no shortage of fantastic pools to enjoy. For us at home, we want a pool to create a central area to our open and somewhat bland backyard. We want it to enhance our lives over the long term, not just for now and not just for the kids. As our home isn’t oversized, we also don’t think we would need to ‘down size’ when we are older, only to end up with no room at the table for grandkids when we enter a whole new ‘phase’. On a good day, our family is at least 12-20 people, for a small gathering. I can’t see a one bedroom apartment being adequate later on for us. Contemporary filtration technology and salt water have also sealed the decision. What we need to balance is the space available. At the most, 12 metres could be spared. That’s a pretty good sized lap pool but it edges towards a massive gum tree which we can’t remove, and don’t want to. It also carves up the yard. While we don’t want to spend our lives mowing the lawn, we also don’t want a concrete jungle. So, now we get to what type of pool. The list is endless. Truly a first world problem for anyone to feel guilty about. All that aside, I’ve decided to canvas some of our favourites below, as they are pools which are truly inspiring and have connection to our modernist 1960s home. 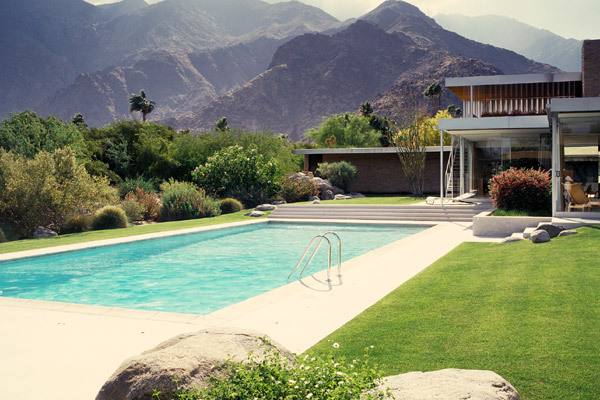 Our first and a big favourite is the very simple Kaufmann House in Palm Springs (below) designed by Richard Neutra. Visiting this house in 2010, the desert gardens seen from the entry are spectacular! But, the house was not open as it is a private home. The best we can do is appreciate the photos from Neutra’s books and in other photographs since. It’s a classic rectangle pool with simple coping and level with the grass. The shape is great with most homes, easy to entertain with, uncomplicated to pave and fence around. Notice this pool has lots of room to ‘breathe’? Our preference is not to enclose pool spaces with fences so close that one feels trapped inside the pool area. It’s hard to go past the kidney pool where retro is concerned. Although less popular in 2014, it was all the rage in the 1960s, 1970s and right up to the 1990s. It’s pretty affordable in a precast fibreglass shape too. 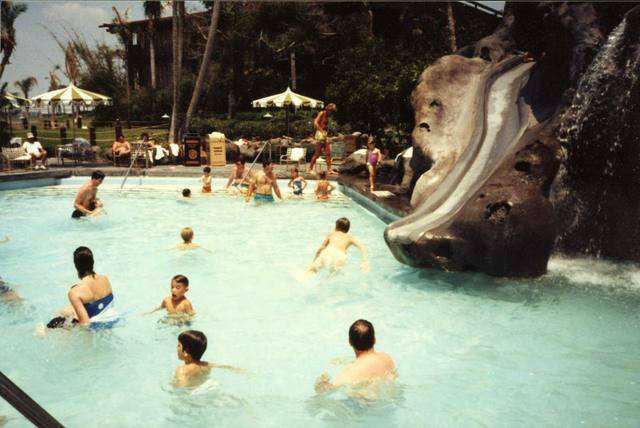 Who didn’t want the Disney Polynesian Pool (above and below) in their backyard? The curves somehow set off the modernist straight lines of Eichler (US), P+S (AU), Case Study and other mid-century homes perfectly. 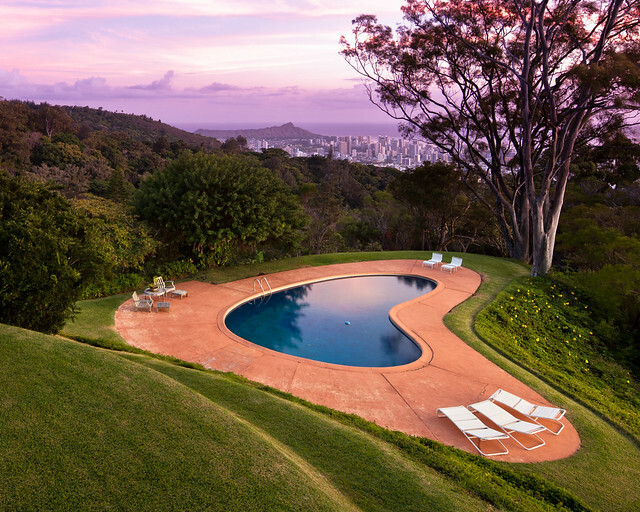 Another related shape is the ‘atomic boomerang’ from Alexander Calder‘s works, and best seen in Modernist architect Vladimir Ossipoff’s Liljestrand House in Hawaii (below). Sigh, such beauty. A quick study of pool dilemmas wouldn’t be complete without the contemporary luxury of a lap pool. Sometime in the 1990s, it became “the” thing to have a pool which one could exercise in, as well as cool off in. It was a perfect solution for every Paddington terrace renovation that lacked even a blade of grass for a backyard, and similarly was featured in some pretty stunning hotel pools like the Adelphi Hotel. It’s been a popular choice for the past 15+ years all around the world. Pingback: Our Pool | Sydney House.